Captioning is the process of turning the audio track of a television broadcast, webcast, film, video, DVD, live event, or other production, into a textual representation to display on a TV, screen, computer monitor, or other visual display and hand-held devices. Captions not only display words as the textual equivalent of spoken dialogue, but they can also include music descriptions, speaker identification, and sound effects. Captions are commonly produced in advance for pre-recorded material. When captions are provided for live presentations, they are called ‘live’ or ‘realtime’ captions. Communication Access Realtime Translation (CART) is a form of captioning that can be provided on-site or remotely, usually for live presentations such as meetings, classes, or conferences, or other events held in a non-broadcast environment. Captions make audio-visual material accessible and provide critical access to communication, information, education, news and entertainment, allowing people to access and participate in society. Captioning technology was originally devised to assist the Deaf, and hearing impaired. But, in recent times, its application has become more widespread to include education, and those individuals with limited English proficiency, English-language learners, and all-round literacy skills. English-language captions improve comprehension and fluency. Captions can also help to improve the literacy skills of children and adults alike. Captions are an excellent way to ‘view’ an audio track in public places or noisy environments such as airports, gyms, bars and schools – anywhere that the public can see video, but may not be able to access the audio. Captioning is usually displayed on the bottom of a screen (but can be at the top for sport coverage) with colouring used to distinguish between speakers and sounds. The ‘CC’ symbol is often used to symbolise closed captions on TV, program guides, DVDs and accessible cinema session guides. Closed Captions are a textual representation of the audio track of audio-visual content, such as a television program or movie. Closed captions can be switched on, or off, by the viewer. The most common usage of Closed Captions is within broadcast television, however Closed Captions are increasingly available on content available via the internet and are also available on DVDs. Unlike Closed Captions, Open Captions are burnt into the video so cannot be turned off and remain permanently on screen. They are visible to the viewer at all times and without any interaction from the viewer. In addition to their use in broadcast, they are often utilised in environments where audio is not available, or not acceptable, such as within conference venues, hotels, doctors’ surgeries, libraries, and other public arenas. Unlike Open and Closed captions, Subtitles are most often utilised in multi-language environments, or when there is a need to translate the dialogue or audio track from one language to another language. They are often similar in presentation to open captions, and can be changed easily for multi-lingual environments. How do I access captions at home? It is much easier to access Closed Captions in your home now than it ever has been before. Each television or set-top-box manufacturer approaches captions differently, however in most instances there is either an easily accessible button on the remote control, or the instruction to activate captions is located within a menu option. Please consult your device’s user manual for specific instructions. How Does the Shorthand Machine Work? The shorthand (or steno) machine has just 22 keys as well as a number bar. Machine shorthand is a phonetic-based language. Unlike a normal typewriter keyboard where one key is depressed at a time, with a steno machine combinations of keys represent certain sounds and, as such, groups of keys are depressed at the same time. The steno machine keyboard is divided into two parts – the left-hand side of the keyboard represents sounds at the beginning of a syllable (it is the left hand which is used here), and the right-hand side of the keyboard represents sounds at the end of a syllable (it is the right hand which is used here). The vowels are found at the base of the keyboard (it is the thumbs which are used here). 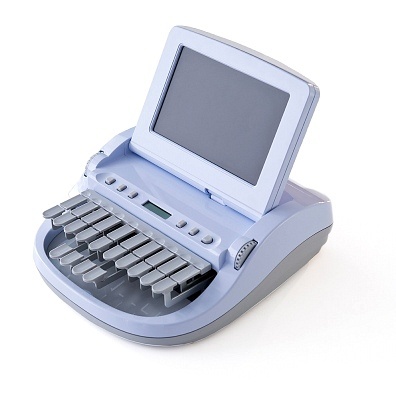 Stenocaptioners can write accurate shorthand at speeds in excess of 220 words per minute. There are specific software programs, which Stenocaptioners use to translate instantaneously their machine shorthand theory into English text. Every Stenocaptioner maintains an individual database (or ‘dictionary’), which assigns English words to phonetic shorthand outlines. Stenocaptioners are continually adding new words to their dictionaries due to the wide-ranging vocabulary that confronts them in their daily work. Occasionally a live caption may contain a word that is incorrectly spelled but which translates phonetically on screen and is therefore able to be understood. This may be an example of where a word has not yet been added to the Stenocaptioner’s shorthand dictionary. COPYRIGHT CAPTION IT © 2015. ALL RIGHTS RESERVED.